As part of our ongoing efforts to serve our members more efficiently, we recently introduced new software at the end of last month. If you have questions, see below to help clarify the changes and what it means to you, our member. Your name & ID number will appear at the top. 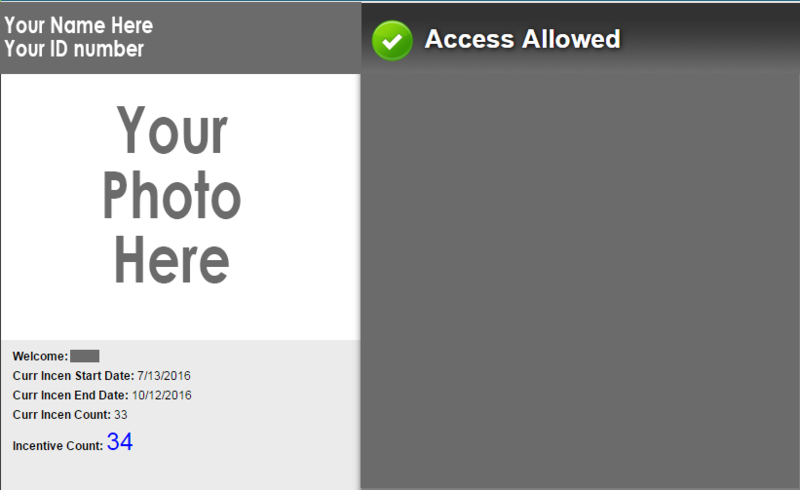 Your photo will appear under your ID number. Both the start and end dates of your incentive period will be displayed to make it easier for tracking your incentive visits. Access Allowed with a green check mark means you are an active member. **Also, you will notice a privacy screen under "Access Allowed" used on each monitor to ensure that you're the only one to see your check-in information. 2. Membership fees did NOT increase. Payroll deduction members – the change is we will be deducting from your payroll every 2 weeks instead of twice per month. As you can see in the chart above, fees collected per pay period will be a slightly smaller amount due to the 26 deductions per year (instead of 24 currently). Pre-pay members – amounts will stay exactly the same as noted in the chart above. Members will be able to place a hold on their membership for a period of 15 days to a maximum of 90 days. **This must be arranged in advance of the hold by coming in to sign a form. Incentive visits that have been earned at the time the hold begins will be carried over to the resumption of the membership. For members utilizing the payroll deduction form of payment, membership begins automatically at the end of the requested freeze. For members utilizing the prepaid form of payment, the member stops by the front desk to resume membership. Members can share a guest pass package with other active members. To do so, you will need to come to the downtown location to let us know who you would like to share it with. Registrations for programs and offerings will now always be 2-weeks out to the minute. EX: if Yoga Foundations program begins Wednesday, Oct 19 at 7:30pm, registration opens Wednesday, Oct 5 at 7:30pm and ends Tuesday, Oct 18 at 11pm. Here is our current Registrations Calendar. We believe these changes will be positive ones, making your participation at the DAHLC even easier! If you have any questions, please stop by the front desk or call 507-266-4688 or email dahlc@mayo.edu. Thank you!